As the territories of Kingsburg expand, the forging of the realm continues! A host of new governors have been given command of outlying provinces of the royal realm, and once again they must influence advisors, strengthen their provinces, and defend the realm from the depredations of marauding foes. Competing with their fellows, governors must utilize brand new abilities and buildings to their fullest to secure a place on the king’s council! Kingsburg: To Forge a Realm adds modular game variants that can be played individually, in various combinations, or all together for a richer gaming experience for your gaming group! This is not a stand-alone game. A copy of Kingsburg is required to play. This expansion is a must have for fans of Kingsburg. In fact if you’re planning on buying Kingsburg, just go ahead and get the expansion with it. You’re getting a lot with your money: Expanded building sheets, randomized building rows, world event cards, character cards and an alternate way of doing the final battles. But honestly, you don’t need ALL of it. The building sheets and rows are great, I absolutely love them. But I’m not a big fan of the battle chips (I know, I’m in the minority). I really like the luck aspect of the final battles, even if I end up losing them. I feel like the chips make it sure you’ll win, and what’s the fun in that!? The character cards are fun, but I don’t feel like I’m loosing anything by playing without them. Same with the world event cards. But again, it’s worth it just for the expanded building sheets. I don’t regret getting the expansion at all. This takes an enjoyable Tier 1 game(Games to play with non-gamers to introduce them to modern boardgaming) and makes into a fun and enjoyable Tier 2 game(Games for those same nongamers to introduce them to a new level of strategy and decision making). My only advice would be start with the new boards and characters and then add the strips and events as your players get comfortable with the first 2 add ons. Save the chips for the last element to try as you will be surprised how sharply this divides your group. Kingsburg becomes a completely new game with this expansion. After trying it, the normal game seems more like the ‘beginners/learning’ version of the game, with the expansion being the ‘full’ version of Kingsburg. Character cards add more flavor and an additional strategic element, we have a lot more buildings (although some are admittedly sub-par compared to others), random events to keep things exciting, and perhaps most importantly, the random dice element for combat is replaced by tokens, which make victory far more a result of planning than luck. A great addition that really completes the game. For the amount of variety in a single expansion, you can’t beat To Forge A Realm. From the army chits that fix a key glitch in the base game, to the ability to customize your city development chart, this is pound-for-pound the best board game expansion I’ve ever purchased. While the new mechanics and options introduced in this expansion may not be as revolutionary as Cities and Knights is to Catan, the number of options available are fantastic. My friends and I opted for the full combo plate and dove head first into all of the new material at once. Ultimately, we found the event cards to be a little more than we wanted to deal with (so many other new strategies to try already), but even with what we felt was a miss, there were plenty of hits in the set to make up for it. Kingsburg was one of the games that got me into board gaming beyond Monopoly and it’s ilk. But it soon started feeling very “samey” and was just getting old. Kingsburg: To Forge A Realm Fixes that. It breathes new life into the original game with a bunch of new added (optional) mechanics. Event cards, army tokens, new buildings, and more. Great expansion. If you own Kingsburg, then this is a no-brainer. Adds just enough to the game to make it fresh again. Also adds more buildings and other add-ons to make the game even more fun to play. Adds a lot of re-playability to the original game. The major item in my opinion is the tokens you use to build your army (used as a bid really,) at the end of the year instead of the kings 1d6 die roll. If you love Kingsburg this makes it better. If you do not like some things like some of the luck factor this reduces it. As a good expansion should it adds more of the same and some new wrinkles. A great, great expansion. Too often there would be non risk games and no one would lose a building. The army point chits fixes this. 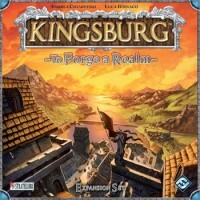 Add a Review for "Kingsburg: To Forge a Realm"